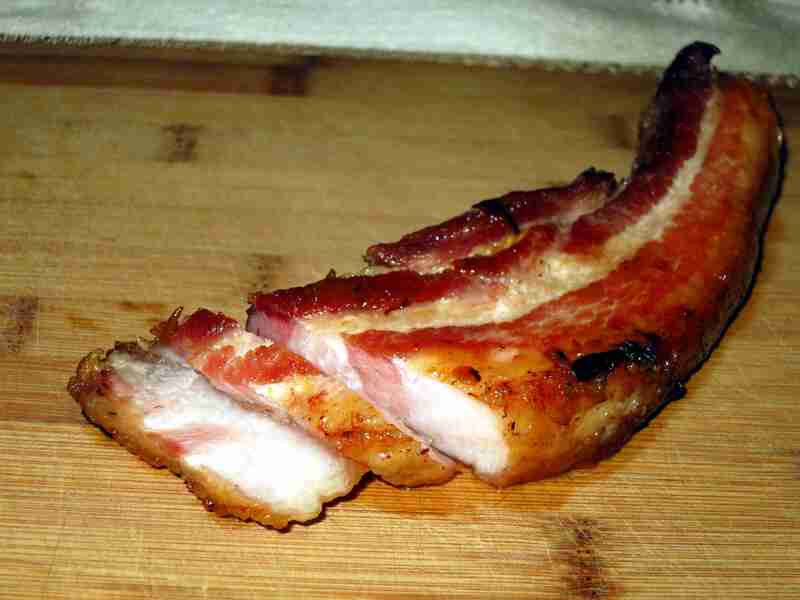 Have you ever tried a slab bacon? They’re not easy to find on the grocery store shelves. In fact, without ordering slab bacon, or asking for it from the farmers directly, I think I’ve probably only seen 3-4 different brands of slab bacon commercially available ever. My guess is that they don’t sell too terribly well, considering people are often concerned with how much fat they eat. Which is a shame. Because slab bacon is absolutely amazing! And you can take that as a generalized statement. Every time I’ve ever had slab bacon, I’ve been glad that I did. In fact, there is a restaurant here in Manhattan that I frequent for the sole purpose of eating the slab bacon they serve me. The bartender knows me and my wife so well that when either one of us walks in the door, they cue up an order of slab bacon for us before even taking our drink order! So, if you haven’t had a slab bacon before, go get one. 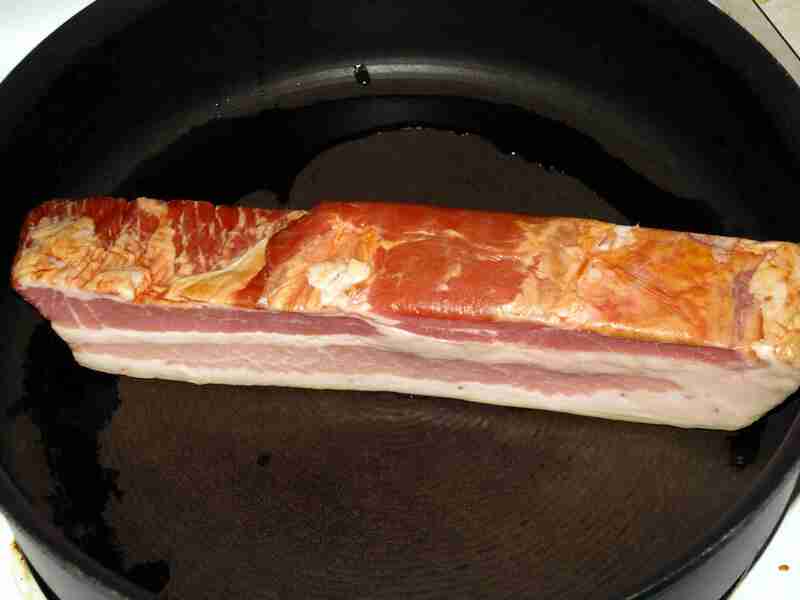 Follow my general Bacon Project rules, of course, but go get some slab bacon! The previous Vermont Smoke And Cure bacon that I bought and reviewed for my Bacon Project was so good that I couldn’t pass up an opportunity to try the slab bacon they sell. 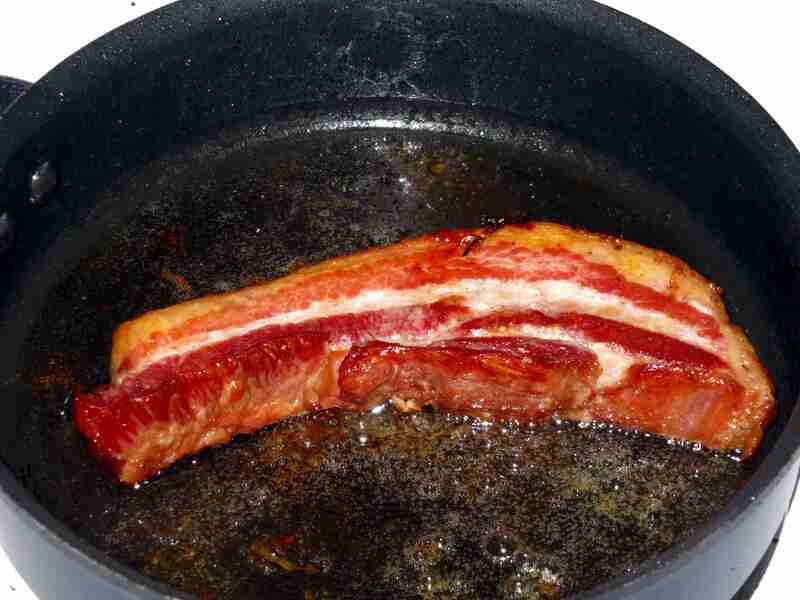 I love slab bacon, if you haven’t gathered that yet. So I had every expectation that the combination of a slab bacon, and the best dern commercially available bacon ever would be unimaginably phenomenal. And I was not disappointed! After cutting it open, I smelled it. The scent was more complex than the scent of the pre-sliced Vermont Smoke And Cure bacon was. It had the same lightly smokey smell about it, but I could detect some other scents in there as well. My sense of smell is not world-renown, but it is pretty good. I smelled just the faintest flavor of vinegar, which I expect was my interpretation of the corn-cob smoke mixed with the maple wood. Like the pre-sliced Vermont Smoke And Cure bacon, the smell did not carry a strong maple scent. I asked my wife to take a few sniffs as well – her sense of smell is world renown. Her general thoughts were similar to mine though she did correctly identify the flavors of the maple wood, and didn’t mistake it for vinegar. I cooked this long and slow, taking more than 60 minutes to finish the cooking process. I started out on high heat with the fat side down, as you can see in the photo. I let the pan heat up all the way until the fat was sizzling and popping, then turned the heat down to low, about a 2 out of 10 and covered it. 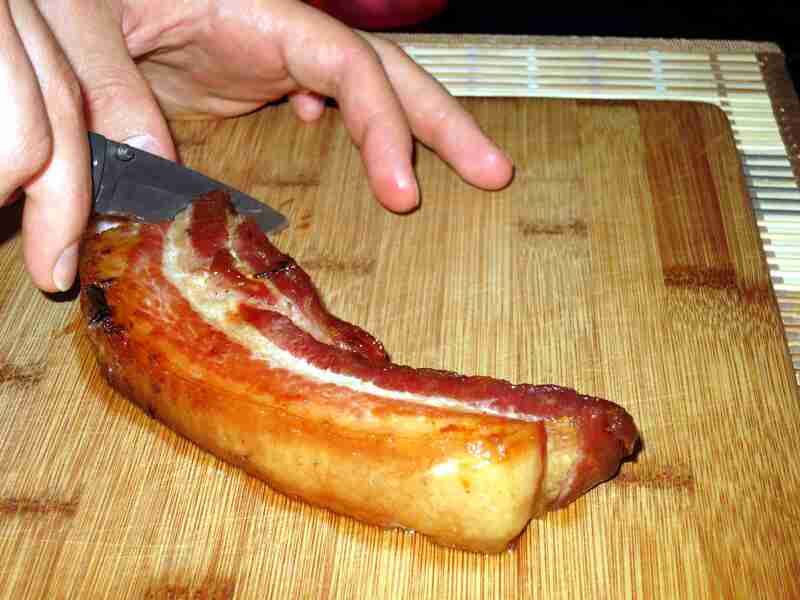 Using tongs, I came back to the kitchen about once ever 10 minutes and turned the bacon on to a different side, making sure that eat side got even coverage. The smokey flavor was astonishing! It had a hint of sweetness, as though the maple wood used was green, and cut in the spring with the maple sugar still in it. 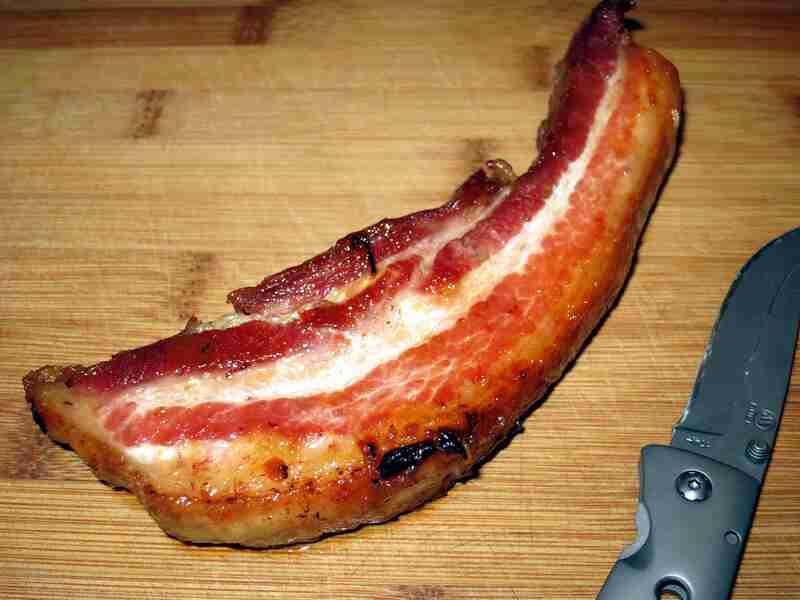 Very subtle, but it really enhanced the smokiness that we expect from a premium bacon. Unlike the Vermont Smoke And Cure sliced bacon, this bacon had a much heavier emphasis on the smoke flavor, and the maple flavor was nearly non-existent. I figure that’s generally ok, though, since it’s maple wood smoked bacon – the extra maple flavor would be the bonus, not the focus. 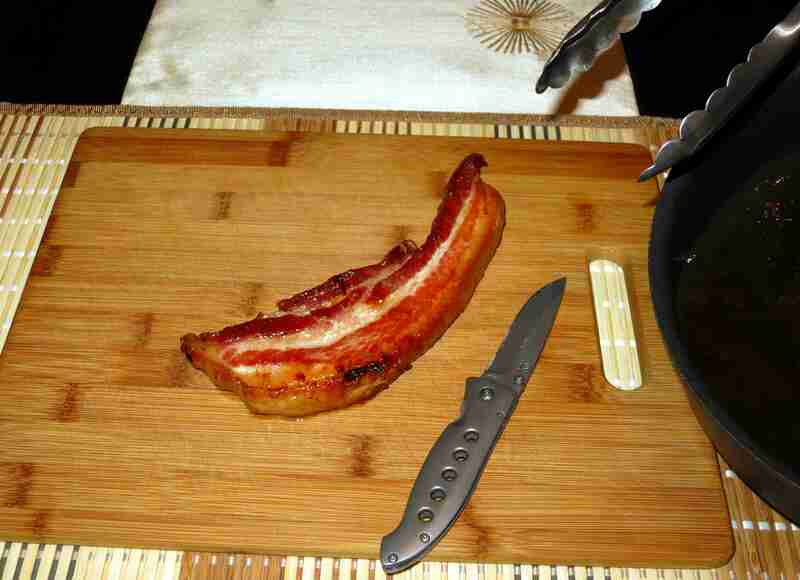 Of course, this is a different product: it’s slab bacon. This is a serious piece of meat, and requires a serious amount of consideration while preparing it, serving it, and eating it. I did the best that I could to satisfy that requirement for seriousness, interspersed with the childlike anticipation of Christmas, by cooking it very slowly on low heat, serving it on a large wooden cutting board, and cutting it, as you can see in the photos with a rugged pocket-knife (of course, I cleaned it first!). I think this would be equally well served being cooked on a grill over the hot coals at the end of a grilling session while everyone is eating their steaks and, like my wife and I did, wait impatiently for the bacon to finish. In fact, if I didn’t live in the urban jungle that I do live in, I might have rigged up something similar to a campfire popcorn cooker, and cooked this slab bacon over a camp fire. 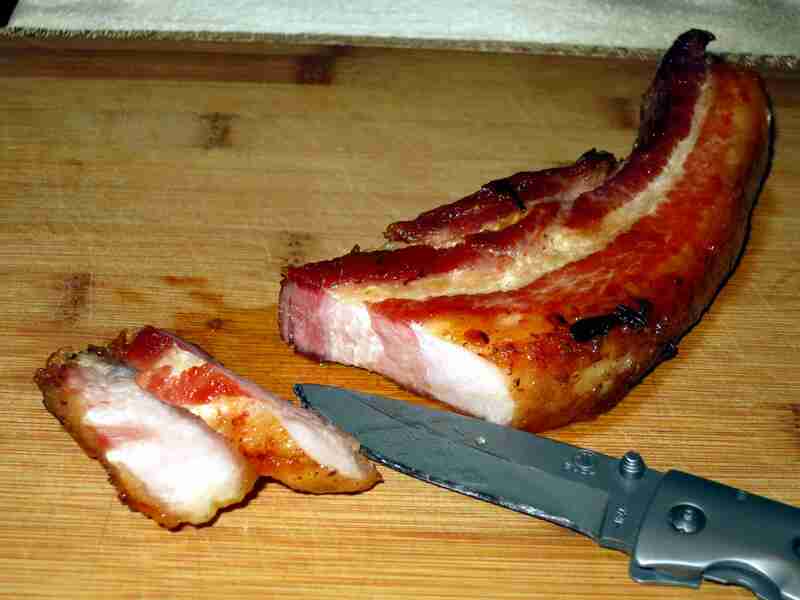 Regardless, the presentation of this slab bacon, when done right, was unbeatable. I could serve this to any guest at any time. It would be appropriate, served as I have done, with even the most white-tie guests. Ok, perhaps I’ve gone just a bit too far – maybe we should cut this off with black-tie guests and events? This one gets a check-mark for the all four categories. 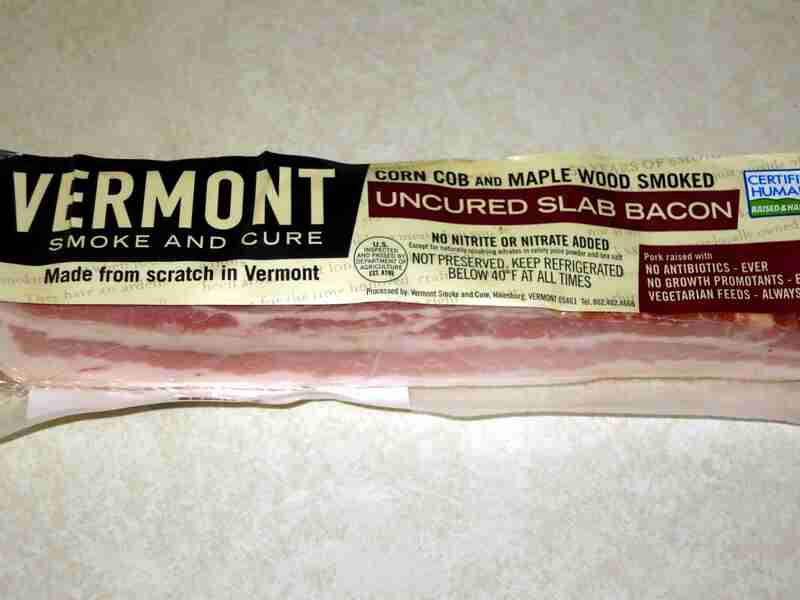 I have researched Vermont Smoke And Cure products in the past, and have even been contacted by one of their representatives on this site about the quality of the pork they source for their bacon (see the comments in my original Vermont Smoke And Cure post). I am confident that they are a top-quality producer for commercially available bacon. Whole Foods – I picked this up at Whole Foods. I am extremely pleased, and will reiterate that this is the best commercial bacon I’ve purchased so far! Awesome! This stuff was amazingly delicious, and I will absolutely be on the look out for other slab-bacon products! As I said in the review, the sliced version was delicious. But this slab-bacon version was orgasmic!!! That may be the most beautiful thing I have ever seen. Ha! I have to agree – and I’m happily married! In fact, I think my wife would agree too!! If you have a whole foods nearby, I’m telling you you won’t regret stopping in and picking up some of this. I was blown away by it! If you don’t, see if you can order it from them online. I will be, and likely what I order won’t even need to be frozen!